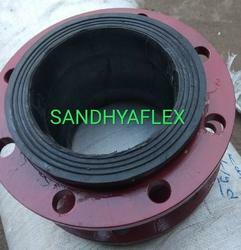 Sandhya Enterprises manufacturer and Supplier of Neoprene Rubber Bellow with Split Flange. 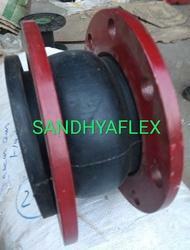 Sandhya Enterprises manufacturer and Supplier of Rubber Bellow Expansion Join both end Shoft. Our products are packed under controlled conditions to ensure their quality is not compromised and buyers are presented with brand new products. We have an ultramodern facility to pack our products. We own a well-constructed storage space that helps in keeping the batch under secured conditions and away from various spoiling factors such as sunlight, water, moisture, dust, rain and others. Sandhya Enterprises based in hyderabad (Telangana), India. 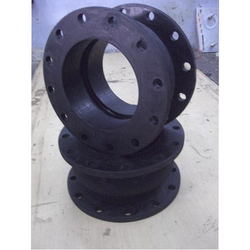 Products range includes Rubber expansion joints, Rubber Bellow. Cyclic movement test for 5000 cycles under design pressure conducted on sizes 1600NB, 2100NB and 2200NB bellows. Manufactured sizes upto 1000mm (39 inches)*. Safety factor built in upto4:1. Manufactured in single or multiple arches. Choice of cover to match liner materials or different materials for better resistance to external conditions. 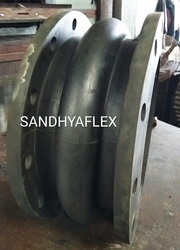 Galvanised carbon steel or stainless steel split backup rings. 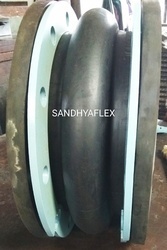 Sandhya Enterpriese Manufacturer and Supplier of Rubber Bellow Soft End as per Customer requirement. 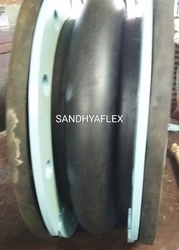 Sandhya enteprises manufacturer and Supplier of Rubber Expansion Joint Bellow. 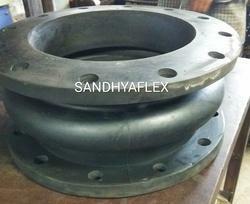 size:25mm ID to 500mm ID, Length -150mm to 500mm, Flange Details as as per ASA 150#, PN10 and PN 16, With Floting Flange and Spilit Flange. 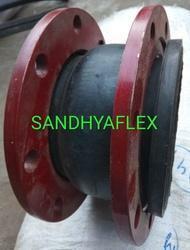 Sandhya Enterprises Manufactrurer and Supplier of Rubber Expansion Joint Bellow. · Cyclic movement test for 5000 cycles under design pressure conducted on sizes 1600NB, 2100NB and 2200NB bellows. · Manufactured sizes upto 3600mm (144 inches)*. · Safety factor built in upto4:1. · Greater movement per arch. · Manufactured in single or multiple arches. · Choice of cover to match liner materials or different materials for better resistance to external conditions. · Filled or unfilled arches. · Galvanised carbon steel or stainless steel split backup rings. With the aid of sophisticated machinery and skilled professionals, we have been able offer supreme quality Rubber Joints to our valuable customers. Available with us at industry leading prices, these products are highly appreciated in the market for their sturdy construction and longer functional life. To ensure a defect free range, these joints undergo various quality...size: 1" to 20" ID , Length-150mm to 500mm. 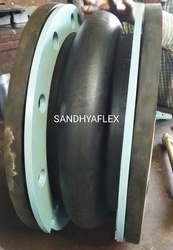 with Both end MS Flange Fitting as per ASA 150#, PN 10 and PN 16 Specification. 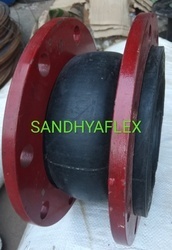 Sandhya Enterprises Manufacturer and Supplier of Rubber Expansion Joint Bellow as per Customer Requirement. We offer ranges of standard as well as custom manufactured bellows to cater for many applications from heavy industry to food quality . The selection of bellows design, open:close ratios, stroke length, convolution width, split or endless configuration, and materials will depend on your specific application. Where molded bellows are not suitable, a range of hand-built rubber bellows are available including tapered and smooth bore. Our hand-built rubber bellows are designed to absorb motion and displacement between pipe flanges. For more than 50 years, Shah India Rubber has stood at the forefront of fluid sealing technology. Our history of growth and success is rooted in our commitment to deliver the most innovative sealing solutions and unparalleled service to the worldâ€™s processing industries. 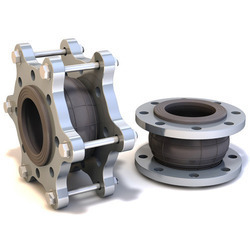 Rubber Expansion Joints protect equipments and piping from damage caused by vibration and thermal movements. While not their primary purpose, they are also frequently used to accommodate equipment misalignments. Rubber expansion joints provide superior flexibility, movement absorption, and cycle life, while resisting chemical attack and abrasion. They are useful over a wide range of temperatures & pressures, making them the preferred expansion joint for most liquid and slurry applications, though gases & solids are also frequently conveyed by rubber expansion joints. 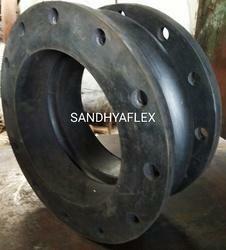 Looking for Rubber Expansion Bellow ?